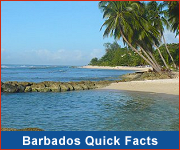 Barbados is served by many regional and international carriers including: British Airways, Virgin Atlantic, Air Canada, WestJet, American Airlines, Jet Blue, Caribbean Airlines and LIAT. In addition, a number of charter airlines run services seasonally, including Thomas Cook Airlines from the UK. Both arriving and departing passengers have access to duty-free shops at the airport.The shops offer local craft, souvenirs, jewellery, perfumes, liquor, tobacco, electronics, shoes and clothing. There is a regular bus service, costing Bds$2.00, to the city (travel time - 45 minutes) which departs every 10 minutes and a 24-hour taxi service (travel time - 30 minutes). More about Barbados public transport. Departure Tax of BDS $55 (US $ 27.50) applies for all passengers over 2 years old leaving Barbados. Effective October 1, 2018 an additional fee has been added - passengers flying outside of the Caribbean region pay US$70 per person, and those flying within the Caribbean pay US$35 per person. Most airlines include this with the cost of the ticket, but check to be sure. Barbados has an international deep water harbour at Bridgetown and is a port of call for a number of British, European and American cruise lines. LIAT and Caribbean Airlines run daily inter-Caribbean flights to most of the neighbouring islands. Charter aircraft are also available. There are also a number of service companies on the island that will organise yacht trips and other short term excursions from Barbados. 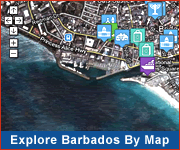 Barbados has a good network of roads which covers the entire island. Traffic drives on the left. There is a speed limit of 60kmph (37mph per hour), except where otherwise indicated. The road journey from Bridgetown to Speightstown takes about 30 minutes and to Holetown or Oistins about 20 minutes. Anything from a mini-moke to a limousine may be hired. Cars may be hired by the hour, day or week. Frequent, comprehensive coverage of the island, flat rate of approx. Bds$1.50 for all journeys. Although cheap, buses are crowded during the rush hours. There are many licensed "Mini Vans" that run around the island picking up tourist and locals. You will recognise them by their "ZR" license plate. They have few fixed schedules but there are many of them and service is frequent. The rate is Bds$2 and is not recommended for the nervous passenger as ZRs stop frequently, often abruptly, and move quickly to pick up the maximum paying passengers in the shortest time. Taxis do not have meters but fares are regulated by the Government. Always agree on the price before travelling in a taxi.